Money is made to be spent, right? But have you ever purchased something only to realize it was unnecessary? I have! Here are some items that you are wasting your money on. Avoid buying these to reduce your buyers remorse and save some euros in the process. Did you know that many store brand products are made from the same company that manufactures the name brand? Not only that, but the store brand products are held to the same standards as their more costly counter parts. Save a little money here and there by purchasing store brand instead of name brand products. Buying too much food, not eating leftovers, and forgetting about food we have all leads to food spoiling. Read these 5 Top Tips for Saving Money on Food to find out what you can do to avoid spoilage, and use what you have. £2 here and £5 there adds up to a lot of money wasted on late fees. And because of what? Poor budgeting? Poor organization? Make it a priority to keep track of when bills are due to avoid late fees. If possible, have payments automatically drafted from your account. Most people think of the lottery as a get rich quick scheme, but that is exactly what it is: a scheme. The only problem is, those getting rich are the ones you are giving your money to. Next time you find yourself ready to purchase a lottery ticket, think about putting that money into savings instead. It’s okay to indulge in that £5 cup of coffee every once in a while, but making it an everyday habit can be the same as throwing money away. Invest in a good brewing system and make your favorite cup of coffee at home. Tap water is drinkable. 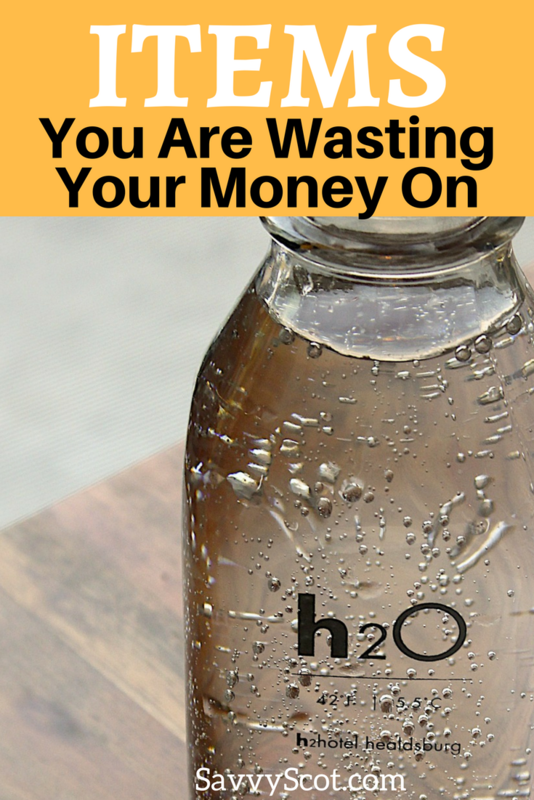 Quit wasting your money on bottled water, especially the more expensive varieties. Get a reusable water bottle and fill it from the tap. It really is cheaper to buy from the store and cook at home. Having a meal plan helps with this. If you have a plan, then you will be less likely to swing by the drive-thru on your way home. The rate at which some upgrade their mobile devices is astounding. Unless than is an issue affecting the use of your phone, hold off on upgrading. If you use mobile devices, watch out for in-app purchases. These are usually bought to “speed up” game play and are a waste of your money. With cleaning products available for your bathroom, carpet, shower, toilet, sink, furniture, and appliances, it’s no wonder we are spending more money than ever on cleaning supplies. Get more out of your money by sticking to a few basic products that clean a variety of surfaces. From napkins to hand towels, these expenses add up. And just think, they are bought just to be thrown away! Why are we buying things just to throw them away? Invest in some quality reusable napkins. They can be used to wipe everything from your hands to your dishes and spills that are a fact of life. If you absolutely cannot wait to get an item, then go ahead and pay the shipping fees, but if you aren’t in a hurry, opt for the cheaper, sometimes free, shipping. It may arrive a day or two later than the fast option, but the money you will have saved is well worth it. Are you still paying on that gym membership you haven’t used in months? Put that money towards a couple of free weights, and get your heart pumping outside for cardio. With a healthy diet, supplements aren’t needed. Do you find yourself wasting money on any of these? Don’t wait until your budget starts to suffer to start cutting out these expenses. See how many you can cut out now.